The purchase is not in mom’s budget and the boys don’t have the money themselves to purchase the items. Obviously they are disappointed. In steps Lauren and Taylor. Lauren describes to Christopher how her mom has taught them to save for things they want to buy. Christopher is intrigued but definitely confused by the whole saving concept. Lauren promised further details after their day at the beach. Lauren’s ingenious plan is to teach Christopher and Ryan how to save, spend and give. The tool she will use to teach this concept is…you guessed it…a lemonade stand. 1. See how hard work leads to profit. 2. Learn the value of waiting to make a purchase. 3. See how to work with others to accomplish a goal. 5. See the joy that comes from giving and sharing. I really liked this book. Being a parent myself I know the challenge of teaching kids the principles of saving, spending and giving. In the book, Lauren and Taylor clearly have these concepts down and are eager to teach their friends. It’s especially refreshing to see kids who are willing to work hard to achieve their goals. Too many parents are spoon feeding their kids and purchasing for them every object they desire. This parental model creates kids who don’t understand the value of work and feel entitled to everything. I’d highly recommend this book for parents or teachers desiring to teach their kids these values. Shannon has done a wonderful job presenting these concepts and the book is full of the kind of big, colorful pictures kids love. The Lemonade Stand retails for $17.95. Shannon shares her story and passion behind the book here. You will find also find at that link a special coupon code you can enter upon purchase to receive a discount on the book. Don’t forget to sign up for the raffle below. 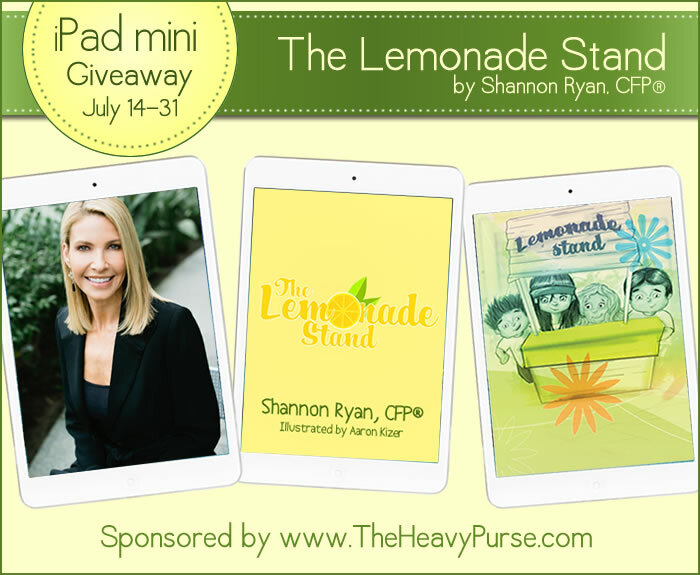 With so many sponsors helping Shannon you have many chances to enter to win. Co-hosted by Are Ya Gonna Eat That, Broke Millennial, Budget and The Beach, Budget Blonde, Budgeting for More, Busy Mom Budgets, Cash Cow Couple, Cents and Sensibility, Club Thrifty, Color Me Frugal, Debt Debs, Debt Roundup, Disease Called Debt, Eat Laugh Purr, Enemy of Debt, Eyes on the Dollar, Femme Frugality, Financially Blonde, Frugal Rules, Living Richly Cheaply, Luke 1428, Making Sense of Cents, Money Saving Dude, Monster Piggy Bank, Not Now Mom’s Busy, Reach Financial Independence, Shoeaholic No More, Stacking Benjamins, Tackling Our Debt, The Broke and Beautiful Life, The Finance Girl, The Frugal Farmer, The Random Path, Thrifty Dad, VeegMama and Young Adult Money. The lemonade stand looks like a great book. I am surely going to get this for kids. I am eagerly waiting to read this book along with my kids. Well written review, Brian. It is a great book. I can understand why your kids loved it! We really liked it. And cool…you were the first one here to get a CommentLuv link! Nice to see it works. It sounds like a great book, one that every parent should be reading to their children. If I had any, children that is, I would most certainly get a copy. Parents reading to children is one of the best ways to increase the kids knowledge and learning. If only more parents realized that. Thanks for your wonderful review, Brian. I truly appreciate it. “This parental model creates kids who don’t understand the value of work and feel entitled to everything.” It’s so true and the worst part is how many parents think they are doing the right thing by giving their kids everything. I know my girls have a very good life but they also know that Mom and Dad work hard to give them this life and we are not entitled to it. Thanks again for your support! You bet Shannon! Glad to be a part of such a great event! Thanks for the book recommendation. As an elementary school librarian I always get excited about new books, especially ones that can make an impact – I’ll look to add this book to my library this fall. It would definitely be worth putting in your library. Thanks, Karen. I hope your students enjoy the new book! Great review Brian! As a parent, I also agree that it’s a great resource for teaching our kids more about money, in fact, I had my 8 year old read it and he loved it. My kids really enjoyed it as well. As much as parents need to talk to their kids about money, kids love learning from other kids too. When I read the book to schools and organizations with the the girls, the other kids respond so strongly to hearing Lauren and Taylor speak so enthusiastically about their save, spend and share goals. And I’m glad your son enjoyed the book too! I got a copy of the book too and it was so well done! I love how she mentions the profits minus the expenses too. I think that is a great money lesson to learn when you are young instead of having that reality hit you hard as an adult. ha ha! “…the profits minus the expenses too.” I thought that was nice touch as well. That’s a pretty advanced lesson some business owners can’t even grasp. I’m glad you enjoyed the book too, Tonya! I know so many parents who suddenly grow anxious when it’s time for their kids to leave home and they realize their kids have very little concept of the “real world”. From how much rent costs, car insurance, gas, groceries to paying taxes. It can be a real slap in the face when you are used to everything being provided for you. “I am a fan of the no-disquis commenting login.” LOL…seems so many people share your view.